I keep hearing people referring to the budget talks suggesting the Medicare should be means tested. Medicare is means tested. You might want it to be more so (the current means test only hits the top 5% of beneficiaries by income), but as my colleague Paul Van de Water points out, it already is…means-tested, that is. You don’t believe me? 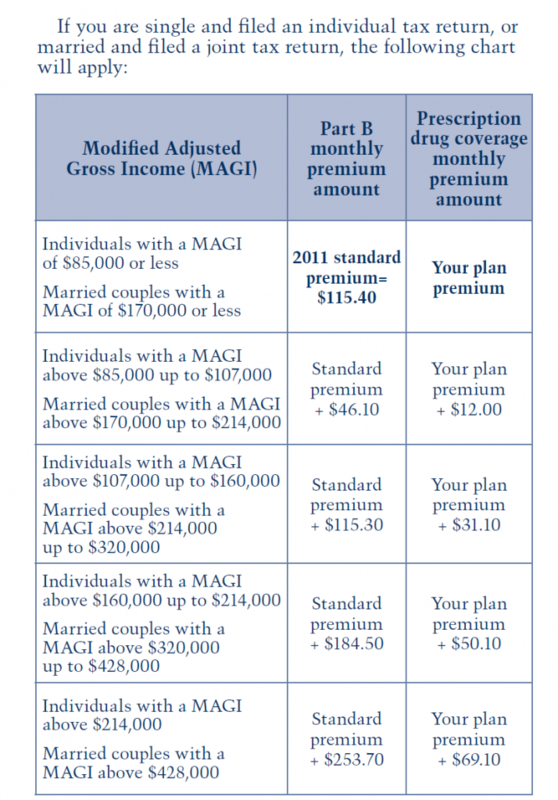 Here’s a table from a Social Security Administration document that explains the means test for Medicare Part B and Part D.
Also, this idea isn’t the slam dunk everyone seems to think it is. I understand the appeal and it certainly makes sense to ask for more for a program facing a tight budget from those who can afford it. But the history of social policy leads me to worry about this: once you shift a program from universal coverage to means testing, it’s increasingly vulnerable to deeper means testing until it eventually becomes a poverty program which everyone wants to get rid of. I’d say the same thing about Social Security. Benefits should not be sacrosanct, but when you’re dealing with these entitlements, any cuts to benefit receipt for persons of any income level should come further down the list from costs savings through efficiency gains and balanced revenue measures. Share the post "Medicare IS Means Tested"
12 comments in reply to "Medicare IS Means Tested"
I just turned 65 and can attest it is means tested. I am in the upper 5% of income and am paying the top adjusted premium listed in your post. By the way it’s still close to $300 less per month than the premium I get through my own company (which I own with my wife). Yes, but then you have to add the cost of a supplement, which will probably run around $300 a month, so you will not really be paying much less, if it is less at all. You can get a Medicare supplement for two people for a lot less than $300. Plan F for two might, in an expensive area, come close to $300. But for most of the population your talking $90 – %140 each. If we can ever clean Medicare up those prices would come down. Plan G or N are less expensive. If you think Medicare or SS should be means tested, what you really mean is that the wealthy are undertaxed. One could achieve the same result with far lower administrative costs by simply raising the top marginal rate by 1%, or instituting a new rate higher up. Fundamentally, the wealthy paid into Medicare the same as anyone else and were made the same promises. It’s not true that just because they want the Social Contract to break, that we are obliged to reciprocate. They paid in. They should get their benefits. This is not a means test, it is a progressive tax. Even the people in the top bracket get FAR more in benefits from Medicare than they pay in premiums. (See the commenter 2 above me who is paying $3600/yr less than private insurance cost when he was younger) A means test would deny access to Medicare to people above a certain income or net worth, and would save quite alot of money. I beg to differ vehemently. Under current circumstances, yes — with liars constantly on the prowl and 26 years before projected exhaustion of the Trust Fund surplus (under current projections that change every year depending on the health of the economy at the time), Social Security benefits, including retirement age, should be absolutely sacrosanct — and liberals should say so, and avoid at all costs their reflexive but destructive tendency to want to seem reasonable and negotiate with liars. For the foreseeable future — probably at least 10 years — the one and only responsible option is to do nothing to the benefits, or, for that matter, to demand that anyone pay more into the system. For 20 years, the Trustees reports routinely have carried virtually the same pro forma statement that something should be done to bring the system into actuarial balance. Saying it is the prudent thing to do, after all. Their hair, however, has hardly been on fire. It is the job of the Trustees to monitor the health of the system, and they will tell us when their hair is starting to catch on fire. That will be the time to do something, and the American people have made it clear that touching benefits is absolutely the last thing to do. Liberals should make no compromise with that wish. Agreed. It is not wise to make new agreements with those who wish us harm as conservatives have shown us by their deeds. I, for one, would be very happy NOT to receive Medicare, but I have no choice, it seems. I am paying over $7000 a year, with a supplement, and am in a position where many doctors do not even accept Medicare. If I elect to see a specialist who will not take Medicare, I still have to pay out of pocket. I would much prefer to opt out of Medicare, and pay privately for my insurance, and I know a lot of people who feel the same way. For starters, why isn’t a study being done, among high earners, to ascertain whether they would be willing to buy their own insurance? It could be enlightening! Medicare is hardly a bargain for me, although many people seem to think it is so cheap, compared to private coverage. Good information. It’s funny you can look up anything on the internet. Guess I’ll quit rambling. Anyways, thanks for the backlink, and best of luck to you! It’s a shame you don’t have a donate button! I’d definitely donate to this outstanding blog! I suppose for now i’ll settle for book-marking and adding your RSS feed to my Google account. I look forward to fresh updates and will talk about this site with my Facebook group. Talk soon! What I don’t understand is that the means testing is done the prior two years….therefore if you have one increase and then the next two aren’t as profitable you still get stuck on just that one year! The tax rates are already means tested as well. According to every objective measure, as a group America’s rich already pay “their fair share”. That doesn’t stop the left from yammering on about it though. A median income worker pays ~$80k into the Medicare trust fund during their career, then the average retiree takes ~$380k back out of the Medicare trust fund in benefits. Dems failed math and think that’s sustainable. They also think that because they paid $80k into the trust fund, they’re entitled to $300k of their kids’ and grandkids’ money.